In their beginning far back in the twilight of the Elder Days, [trolls] were creatures of dull and lumpish nature and had no more language than beasts. When [Bilbo] peeped out in the lightning-flashes, he saw that across the the valley the stone-giants 1 were out and were hurling rocks at one another for a game, and catching them, and tossing them down into the darkness where they smashed among the trees far below, or splintered into little bits with a bang.... 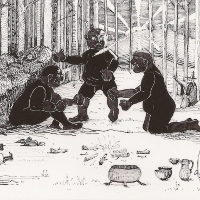 They could hear the giants guffawing and shouting all over the mountainsides. 'Dawn take you all, and be stone to you!' said a voice that sounded like William's. But it wasn't. For just at that moment the light came over the hill.... William never spoke for he stood turned to stone as he stooped; and Bert and Tom were stuck like rocks as they looked at him. And there they stand to this day...; for trolls... must be underground before dawn, or they go back to the stuff of the mountains they are made of, and never move again. Boromir leaped forward and hewed at the arm with all his might; but his sword rang [and] glanced aside.... The blade was notched. Sauron had made use of [trolls], teaching them what little they could learn, and increasing their wits with wickedness. [At] the end of the Third Age a troll-race not before seen appeared in southern Mirkwood and in the mountain borders of Mordor. Olog-hai they were called in the Black Speech. That Sauron bred them none doubted, though from what stock was not known. Some held that they were not Trolls but giant Orcs; but the Olog-hai were in fashion of body and mind quite unlike even the largest of Orc-kind, whom they far surpassed in size and power. Trolls they were, but filled with the evil will of their master: a fell race, strong, agile, fierce and cunning, but harder than stone. Unlike the older race of the Twilight they could endure the Sun, so long as the will of Sauron held sway over them. Trolls were abroad, no longer dull-witted, but cunning and armed with dreadful weapons. Great engines crawled across the field; and in the midst was a huge ram, great as a forest-tree a hundred feet in length, swinging on mighty chains.... Great beasts drew it..., and behind walked mountain-trolls to wield it. [There] came striding up, roaring like beasts, a great company of hill-trolls out of Gorgoroth. Taller and broader than Men they were, and they were clad only in close-fitting mesh of horny scales, or maybe that was their hideous hide; but they bore round bucklers huge and black and wielded heavy hammers in their knotted hands. Reckless they sprang into the pools and waded across, bellowing as they came. Like a storm they broke upon the line of the men of Gondor, and beat upon helm and head, and arm and shield as smiths hewing the hot bending iron.... Beregond... fell; and the great troll-chief that smote him down bent over him, reaching out a clutching claw; for these fell creatures would bite the throats of those that they threw down. 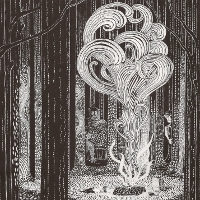 Then Pippin stabbed upwards, and the written blade of Westernesse pierced through the hide and went deep into the vitals of the troll, and his black blood came gushing out. But Orcs and Trolls spoke as they would, without love of words or things; and their language was actually more degraded and filthy than I have shown it. [Olog-hai] spoke little, and the only tongue that they knew was the Black Speech of Barad-dûr. 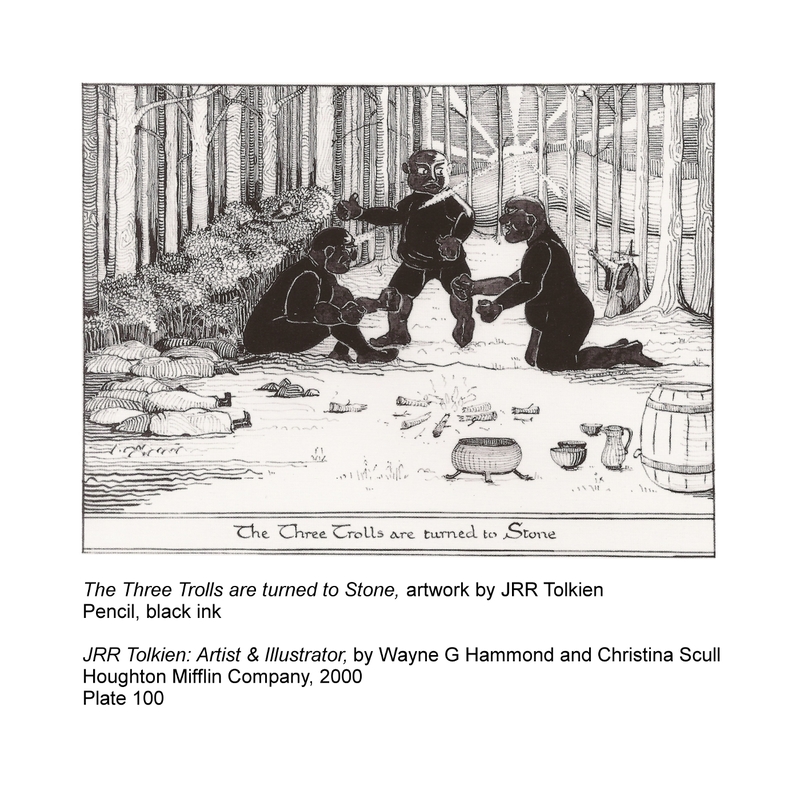 1 The stone-giants are only mentioned in The Hobbit. It seems probable that they can be interpreted as a type of troll. 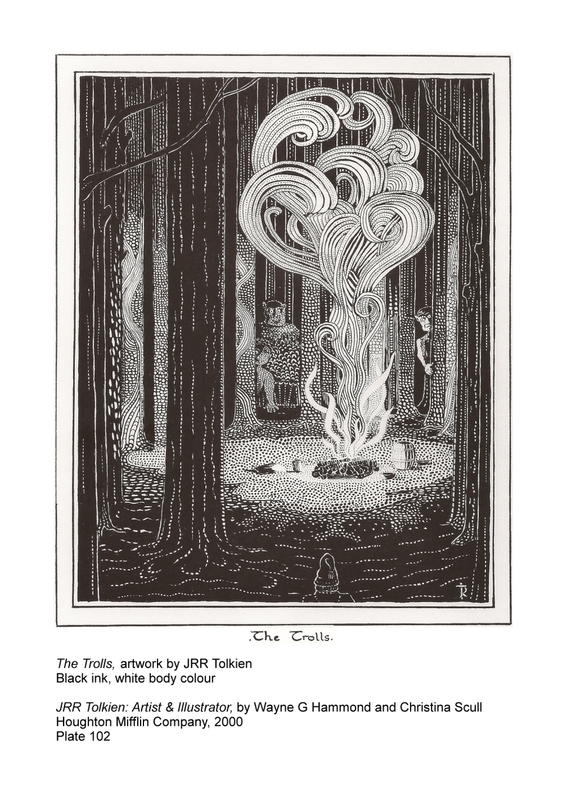 Both are large and apparently malicious beings, and in Appendix F of The Lord of the Rings, Tolkien mentions as a type of troll the Stone-trolls of the Westlands, who spoke a debased form of Common Speech, and this description certainly applies to Bert, Tom, and William Huggins.